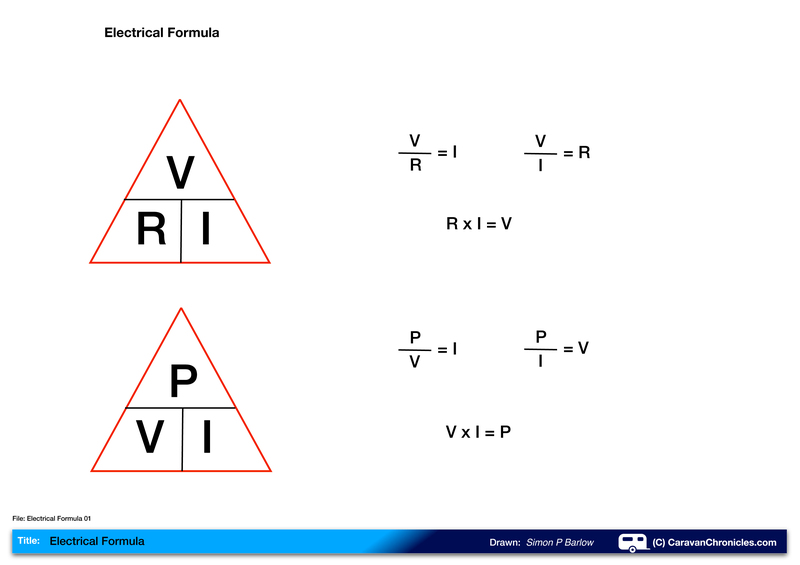 A very basic introduction to some simple maths that allow you to work out power, current and resistance. In some of the guides I have included calculations for working out current, resistance etc. A basic understanding of how to do this will help when fault-finding or deciding on the correct cable size when adding accessories. If you have little or no electrical background it can get confusing, so hopefully this guide will make it clearer. So how are these four things related? As we usually know two parts of the equation, it’s easy to work out the third. We can see that the current drawn is less. What’s going on? Well manufacturers usually give a ‘nominal’ voltage rating, in this case 12 volts. That’s what they have based their calculations on. So that’s what we will use. 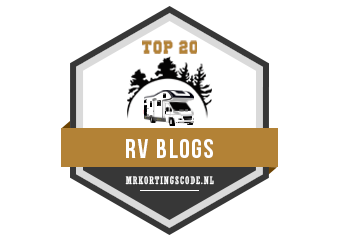 When an Electrical Engineer designed the wiring for your caravan they will have used the ‘nominal’ voltage to choose the correct size cable and fuses for various circuits, with a little safety factor built-in of course. Lets look at another example. The 12 volt accessory socket (cigarette lighter) has a fuse rated at 10 Amps – What wattage appliance can I plug in? A device with a maximum rating of 120 Watts can be used. Again we used the ‘nominal’ voltage for this calculation. If we used the actual fully charged battery voltage we would get 13.5 x 10 = 135 Watts which if we used as the battery voltage dropped would overload the circuit – P / V = I or 135 / 12 = 11.25 Amps so greater than the 10 Amp fuse. You are on a 10 Amp EHU – How many Watt’s is that? So you can now measure the resistance of the heating element and you have a calculated figure as what to expect. It’s as easy as that. However a word of caution. 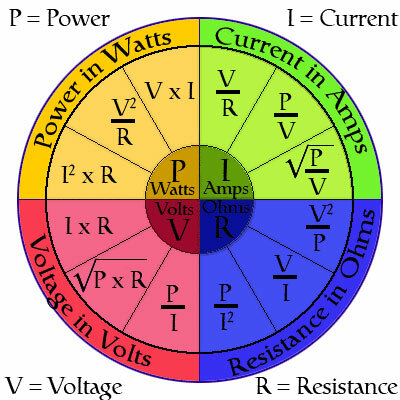 When you calculate wattage, resistance or current, these should be guides. In the real world things are not always to tolerance and you can get slight variations, so treat you calculated result as a guide and not an absolute. This is awesome I have always had a hard time learning and it takes a certin person for me to learn from and this was perfect for me! Thank you for much for sharing this Info!!!!!! Why is Amps abbreviated to “I” instead of A and Watts abbreviated to “P” instead of W. Isn’t it a bit like calling an apple an orange? I’m sure there’s a reason, just wondering what it is, apart from making it harder to understand. The watt unit is named after James Watt, the inventor of the steam engine and is a derived unit of power. One watt is defined as the energy consumption rate of one joule per second. I have never been able to grasp this….so I ave up physics at O-level! So if you have a, say, 1kw something and an inverter….how many amps at 12v do you need? It’s quite simple, power is always the same no matter what the voltage. So 1Kw (1000w) at 230 volts = P (watts) divided by volts. 1000 / 230 = 4.347 Amps. The same 1000 watts if supplied by a 12 volt system is 1000 / 12 = 83.33 Amps. The inverter power usage will probably add another 3 to 4 amps to this. So to power a 1Kw running on 230 volts via an inverter from a 12 volt battery will mean you are drawing around 85 to 90 Amps. Thanks…that helps me…so…if you need 90 amps what battery capacity should you have so you don’t b. them up? That’s assuming you do not want to pull 1kw for more than a few minutes..or is considering doing this off 12v a bit silly? Personally I wouldn’t look at a battery less than 120 Ah….. If physical size and weight is not an issue, I’d opt for two 100 Ah batteries connected in parallel. I would also keep the connecting leads from the batteries to the inverter as short as possible. How do you test a 12 volt 6 prong relay? “Normally” is when the relay is not powered. It is a simple matter now of using a multimeter to check the individual switch contact to make sure when the relay is not powered they are either closed or open and when the relay is powered up they change over correctly. You would also need to check the resistance of the four non coil terminals to verify the relay is working properly, correct? Generally if relay stops working it’s down to the coil either going OC or SC…. personally I’ve never come across a relay that has failed due to the contacts with one exception – I had a 40 amp relay that welded closed after carrying the starting current of a V6 4 x 4 Diesel. Thank you for the reply. I’m trying to learn and came across this post which was very helpful.